We're here to help you setup shop, provide ongoing training and support; plus we make an impressive offering of products available to your store. One out of ten people are in the market for a new mattress right now. The mattress industry has increased in growth annually for the last 30 years. By becoming a dealer, you have the ability to specialize pricing for each customer to ensure maximum savings. As a Mattress Folks dealer, you choose your days and hours of operation. We allow you the freedom to run your showroom the way you see fit! Mattress Folks has positions that pay based upon performance. Ambitious individuals are able to write their own paychecks with an unlimited income cap! Dealers are allowed to show off their creative side to personalize marketing specifically for your business needs. Secure your financial future in a profitable industry by becoming a Mattress Folks dealer. 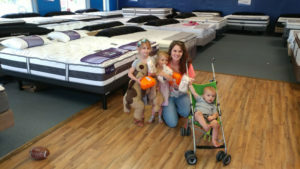 Mattress Folks is a competitive, independently owned company. Our training program is designed to “go with the flow”. Every showroom and team is different so we train based on your strengths and weaknesses. If you are a highly motivated leader, who craves success, Contact us today for dealer pricing.